Cuscuta obtusiflora var. glandulosa. Copyright © 2005.Robert Corbett. Texas A&M Bioinformatics Working Group.botany.csdl.tamu.edu.. (Accessed 4/2014). Cuscuta obtusiflora var. glandulosa is a parasitic annual vine, stem yellow or orange. 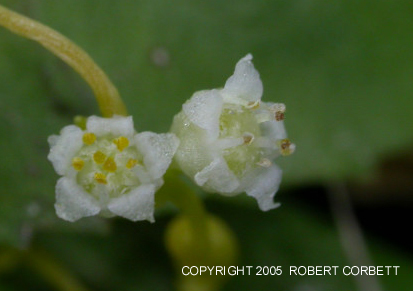 Flowers white, 5-parted, 0.2 cm, in dense clusters, petal lobes egg-shaped, tips blunt, calyx often glandular, lobes rounded, reaching bases of petal lobes. Fruit dry, hollow capsule, rounded, cupped by old flower parts; seeds 1.5 mm. Frequency in NYC: Rare (NYSS1, E). Origin: Mostly the Southern USA. NYC probably the northern limit of range.